I recently read in an online article that, in Australia, we waste up to 30% of the food we purchase – which is a crazy amount of food going to waste! I try my best to be mindful of food wastage, and I’m always thinking ahead on ways to use up my leftovers to prevent them from ending up in the bin. So, I thought I’d share all of my tips on using up and storing leftovers to prevent food wastage! 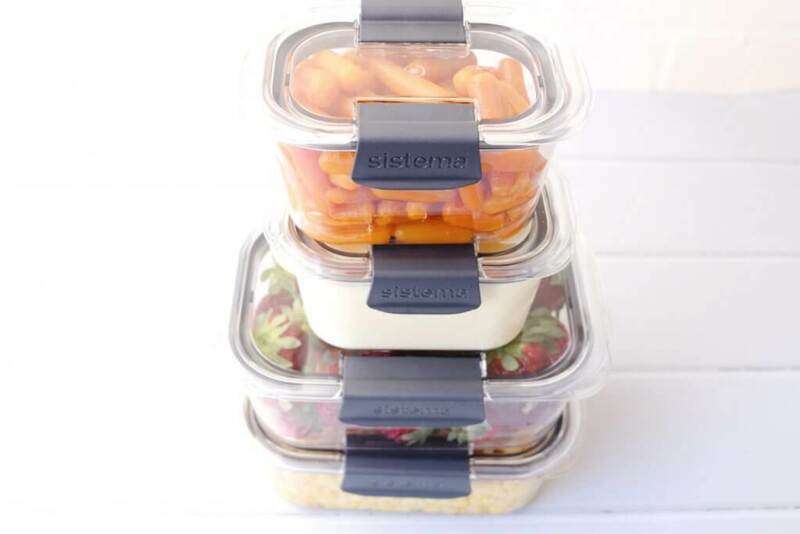 When choosing storage containers to store leftovers, you should pick clear containers, like the crystal-clear bases and lids of the Sistema Brillance range that allow you to see the contents inside. Their stain-resistant construction maintains a spotless look and makes them super easy to clean. These containers also feature built-in microwave vents for safe and simple heating (perfect for leftovers) and re-heating – plus they’re freezer-safe too! Check out the fantastic features of the Sistema Brilliance range below! It’s all in the prep! If you prepare food, you’re more likely to use it up. I like to chop up a few days worth of fruit and vegetables as soon as I buy them so they are ready to go when I cook my meals. Not only does this prevent food wastage, but its a huge time saver for me. I’m really big on freezing foods for storing up my leftovers. If you know you won’t be using it within the next day, freeze those leftovers and use for another meal! You can freeze just about everything. Just make sure you store them correctly to prevent freezer burn, and label them so you know the date frozen and what it is. One of the easiest ways to use up leftovers is to create a whole new meal out of it. Think of ways you can use the leftovers in pies, casseroles or pasta-style bakes. Pie makers are a hit right now! I use mine at least once a week to use up leftovers as the pie filling, and then I freeze the pies. Not only easy to do, but a money saver too! The Sistema Brilliance range is perfect to use for taking leftovers to work and reheating in the microwave. If you don’t have a microwave or are sending leftovers for school lunches, you can use a thermos container to keep food warm until lunch. Lunchbox packing made easy with these 10 lunchbox packing tips!